While we all enjoyed our remaining days of summer vacation, the field hockey team has been on campus since mid-August preparing for its upcoming season and getting some much needed reps on the newly surfaced Smith Field. After failing to make the NESCAC Tournament the previous two seasons with identical 2-8 conference records, the Cardinals look to field an experienced and competitive team that will get them back into contention. Head Coach Patti Klecha-Porter, who is entering her 32nd season at the helm of the program, will look to her four seniors and six juniors to lead the team and help the eight incoming first-year students adjust to college both on and off the field. The Cards lost their leading goal scorer and points leader Hannah Plappert to graduation, but will return Lauren Yue ’17, who had three goals and three assists last season. Yue was named a co-captain along with Hart at the start of the season and has started every game since first arriving to campus in 2013. While the Cardinals graduated four seniors, only 4 of the 16 returning players did not start in at least one game last season, and 9 started at least half of the games. This should set them up to be one of the more experienced teams in the NESCAC. 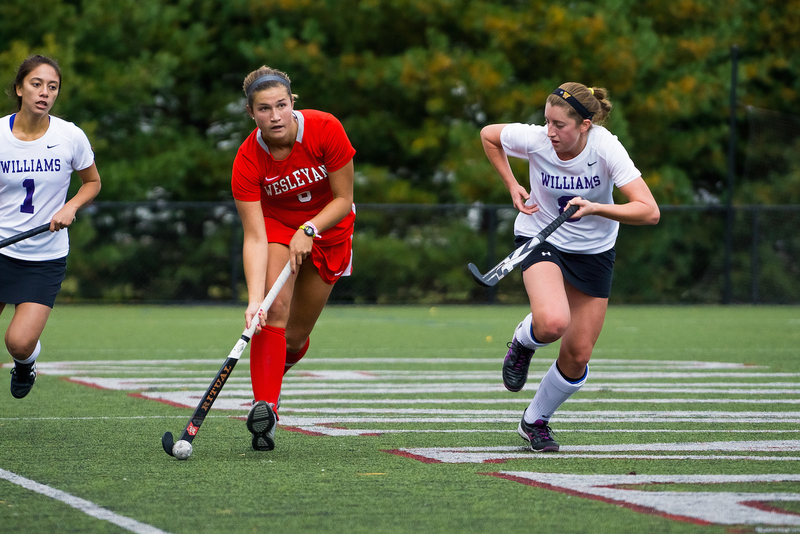 As Klecha-Porter pointed out, Edelman will finally get her chance in the net for the Cardinals, filling the void left by Sara Grundy, who graduated last spring. Last season, Grundy was the Cardinals’ netminder for all but 9 minutes and 42 seconds of game-time and recorded 151 saves and the fourth best save percentage in the NESCAC at .791. As is the case at the start of every new season, the team began preseason by focusing on the fundamentals and making sure everyone was working together. The Cardinals have already started to see their hard work pay off. They won both their scrimmages 5-3 and 4-0 against the Wes Alumni and UCONN Club team, respectively. Since the NESCAC Tournament’s inception in 2000, the Cardinals have failed to make postseason play only three times. Getting back to the tournament is a very achievable objective for the team, according to Hart. If the Cardinals are to make it back to the Tournament, they need to come out of the gates firing given their first three games are on the road and four out of their first five are against ranked opponents. The season kicks off Friday, Sept. 9 at Babson College. While the Cardinals lead 7-4 in the head-to-head play, the Beavers have won the last two meetings by a score of 2-1 each. The Cardinals will then head back up to Wellesley, Mass. on Sunday, Sept. 11 to take on Wellesley College. Next, the Cards hope to improve to 9-0 all-time against Eastern Connecticut State University before returning to Middletown for the start of conference play and their home opener on Saturday, Sept. 17 at 12 p.m. The match will mark the first official game played on the resurfaced Smith Field. The Cardinals will be tested early on their new surface as they will host defending NESCAC Champion, NCAA runner-up, and perennial powerhouse Bowdoin, which currently sits as the second-ranked team in the preseason polls behind Middlebury. Although the Cardinals have not beaten the Polar Bears since 2009, the Cards will hopefully have a handful of wins under their belts by the time the two teams meet and be primed to pull off the upset.